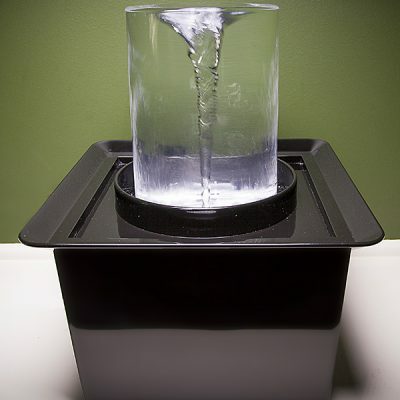 Having trouble with your tabletop Vortex Fountain? Here some common issues and solutions. Bubbles are swirling in the vortex chamber. 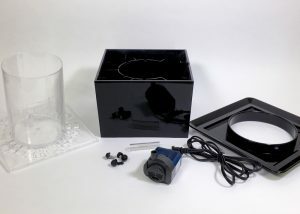 The pump is sucking air; turn off the fountain, let the water drain from the Vortex Chamber, and add water immediately. The pump is making a sucking sound. Water is not falling evenly around all sides of the vortex chamber. The fountain may not be completely level. Use the mini-level tool to check the level and adjust the level using the leveling feet. See the full instructions in the Owners Manual. Also, check the pump input to make sure it is all the way open (turn the dial toward the plus (+) sign and that there is no debris blocking the pump’s intake. The decorative tray won’t seat properly. Remove any decorations or debris from around the edges of the tray and make sure the pump’s electrical cord is in its slot. The pump doesn’t seem to be moving enough water. Make sure the pump’s intake regulator is fully open (turn it toward the plus (+) sign), make sure the pump’s intake is not clogged. Water is leaking out of the back of the fountain. The fountain has been over-filled. While the fountain is turned off and the vortex chamber is empty, fill the fountain’s reservoir to just-below the electrical cord notch. Filling to a level at or above the notch will cause water to drain through the notch. Reducing vibration and pump sounds. Low Water Level. When the water gets too low, the pump can struggle and bit and generate extra noise and vibrations. Topping up the water level can help. Leveling feet. We have found that it’s best to have the leveling feet screwed into the base as much as possible, only having them out just far enough to make the fountain level. The farther they are out, the more vibration they transmit into the table surface. Pump feet. The rubber pump feet (or the suction cups) can help reduce vibrations when the pump touches the bottom of the reservoir. Type of Table Surface. The surface on which the fountain sits can also make a difference. For example, wood tables tend to transmit and amplify the vibrations more than, say, a granite countertop. A dresser with drawers and open cavities also tends to amplify noises. A wicker table absorbs almost all of the vibration. 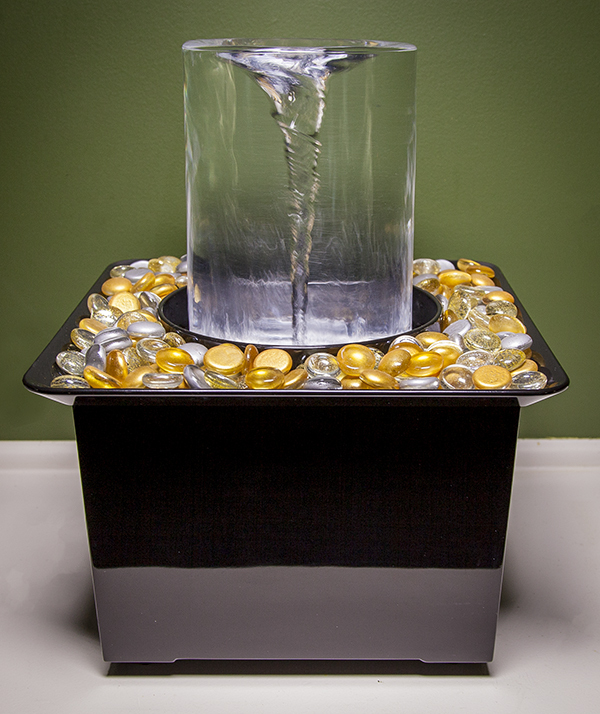 In some cases, simply putting the fountain on a heavier surface can solve a noise issue. Twisted Pump Tubing. Sometimes, if the pump is twisted sideways on the tubing, it can touch the sides of the housing, creating vibrations and noise. A quick readjustment to move it away from the housing can resolve the issue. Imbalanced Impeller. In rare cases, the pump’s impeller can become imbalanced and cause the pump to vibrate. Usually, cycling the pump on and off a few times in quick succession can knock it back into place.